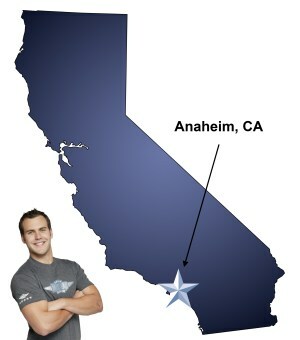 If your future includes a move to Anaheim, check out Meathead Movers! Our professionally trained student-athlete movers, moving concierge, and princess packers are prepared to get you safely moved into your new Anaheim home. When you make your move to Anaheim, be sure to contact Meathead Movers. No matter what type of moving service you need, our student-athlete movers are ready to handle all your moving needs. Welcome to Meathead Movers of Anaheim! Meathead’s Anaheim Movers Will Get You Settled! While Anaheim may be famous as the home of Disneyland, there’s a lot more here than just Space Mountain. Home to two sports teams — the NHL’s Anaheim Ducks and MLB’s Los Angeles Angels of Anaheim — and eight libraries, Anaheim has something for everyone to enjoy. The city has grown greatly from its humble agrarian roots. Once just a simple orange grove, Walt Disney developed that land into the Disneyland Resort, which eventually helped Anaheim grow into a world famous major corporate center. Today, the world’s largest zipper maker, YKK, and high-tech Fisker Automotive have facilities in Anaheim as a part of its burgeoning commercial sector. Anaheim features several opportunities for outdoor diversion. Its two golf courses served Tiger Woods well when he grew up in the city, and the Oak Grove Nature Center features live animal petting and hiking trails. People who like a bit of Hollywood mixed into their stroll will enjoy the Anaheim Walk of Fame located near the Harbor Boulevard entrance to Disneyland. Home to private Anaheim University and surrounded by private universities and University of California and California State University campuses, Anaheim is a mecca for college students. Some of these college’s athletes join Meathead Movers to provide our unique mix of high quality moving services. Our local student-athlete movers have the strength to not only move your belongings, but to jog when they are not carrying boxes, making your move as fast as possible. If you need help packing, our Princess Packers give your prized possessions the royal treatment as they safely and gingerly pack them for you. Whether you need help for your local, long-distance, or commercial move, Meathead Movers, has you covered. When you entrust your move to Meathead, you can rest assured knowing that your move will be a success because our professionally trained student-athlete movers are the best movers the industry has to offer. With our 100% satisfaction guarantee, the only thing you have to lose is the stress that comes from moving! Give us a call for a no obligation quote and experience the Meathead Difference. Moving to Anaheim? Here are some helpful resources. They were fast but very careful with items. Friendly, polite and explained everything i needed to know. Bringing a slightly larger truck in case your estimate is short would be good. We should not have had to be asked to choose what we were going to leave behind (which we ended up not having to do). But we also should not have had to make multiple other trips with our own cars when it should have been estimated for in the truck. We may have had one workbench that missed the estimate, but we had a lot less “stuff” on moving day than the estimate day as we took a lot of items to be donated. Moving staff was great. Kept moving and worked hard. Packing ladies talked and took their sweet time. The estimate of a few hours took a whole day. And they still ended up not packing up several framed items on the wall and one whole closet. But was so last their time that we didn’t ask them to stay and do those items. Helpful, reliable and works hard.